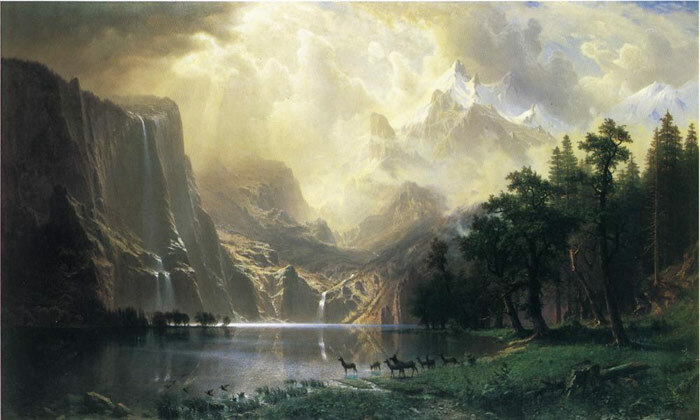 Albert Bierstadt’s Among the Siera Navada Mountains, California is a scenic canvas oil painting on display at the National Museum of American Art in Washington, DC. Created in 1868, this enormous painting is approximately six by ten feet in size (Honour and Fleming, 2000). The subject matter of this painting is typical of Bierstadt, who is known for his detailed landscapes, especially those of the Rockies and Sierras of the American West. Collectively, Bierstadt paintings are manipulated and slightly idealized scenes based on actual places he visited.
" Among the Siera Navada Mountains, California" depicts nature’s beauty in a peaceful quiet solitude way as to entice the viewer to experience the wilderness first hand. Swirling clouds at the top of the scene gives the painting a sense of airiness and an almost mystical god-like quality. Seemingly the viewer is looking from a vantage point that is higher than the foreground as though one is looking down towards the lake and up into the mountains. In this piece, brush strokes are barely visible and the surface is smooth in texture suggesting the photographic realism of a camera. Darker clouds cover the top left and right hand corners adding to this effect. The trees on the right and the cliffs on the left create a “v” in the center of the painting, which draws the viewer’s eye towards the lower center. The rest of the "Among the Siera Navada Mountains, California " is meticulously detailed. The foreground containing short grasses and the lake is smooth and as the eye moves upward the scenery gets progressively rougher. SPECIAL NOTE : The painter will make the reproduction as close to the original oil painting as possible. If you want your painting to alter from this likeness, please email us and " Among the Siera Navada Mountains, California , 1868 " will be reproduced according to your special requirements.